During the discussions on last weeks post on the very fast CMB, Russell sent me the above impressive photos from when HMS Renown (tbc) visited Auckland. An impressive number of woodys featured. How many can we ID? – I have attached a numbered, L>R (1>7) photo below. There is potentially some confusion as to the date/year of the visit & whether in fact it is HMS Renown or her sister ship HMS Repulse. Renown came here solo in 1920 with the Prince of Wales and again in 1927 with the Duke & Duchess of York. Maybe it’s Renown in 1927 but it could be Repulse in 1924 or Renown in 1920 (fyi Luana that can be seen in the photo was launched in late March 1920 only a month before the 1920 visit). Robin Elliott is correct in saying that this is the 1920 visit of the Renown. Below are a couple of photos from the Auckland Weekly News dated 29 April 1920, unfortunately they are not that clear. The small steamer in the foreground and to the left in the second view is the Onewa, the tug closing in on the bow is the Te Awhina. This entry was posted in 1920's, CYA Boat, Events, Launches, Military and tagged HMS Renown, Luana by Alan Houghton - waitematawoodys.com founder. Bookmark the permalink. It is the Te Awhina, in 1924 this was the only tug of a reasonable size that the harbour board owned. 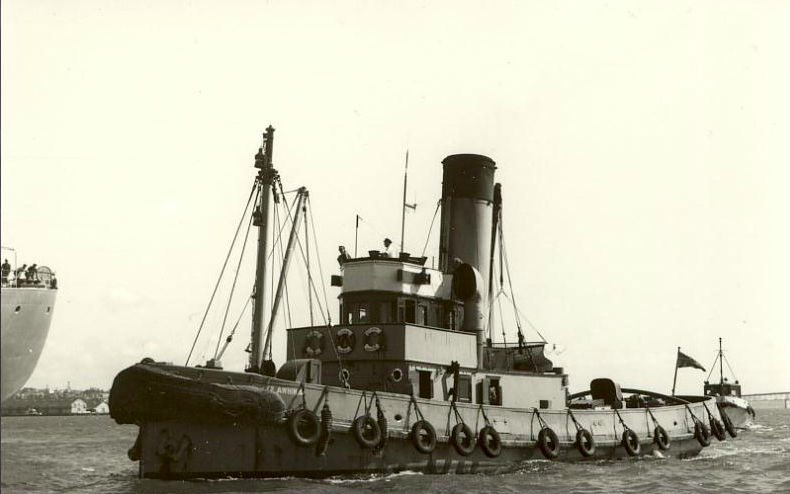 The privately owned paddle steamer tug Lyttelton could sometimes be called upon when not towing log rafts on the coast. Also the ferry company had a smaller tug named Young Bungaree. Both very different looking tugs to the Te Awhina. If it’s not TE AWHINA, then what is it?? There’s absolutely no doubt that CMB123 was on REPULSE in the 1924 visit. That’s borne out by the newspaper report attached to the thread. I still believe that Saturday’s posting of the CMB launch was during the visit of the Hood and Repulse to Auckland in 1924. In the background can be seen the Repulse at anchor, the Hood was alongside Princess Wharf. This visit was a Royal Navy “showing the flag” visit and therefore not improbable to have had the CMB onboard one of the battlecruisers to further impress the locals. The 1927 visit of the Duke and Duchess of York had the Repulse berthed alongside and is less likely to have had a CMB onboard to show off or in any way “steel the thunder” from the visiting royalty. Also by 1927 most of these launches had either been scrapped or sold out of the navy. The Tug looks to small to be the Te Awhina,, Russell will be able to confirm this. Robin is right. The bottom pic is RENOWN 1920 with the Prince of Wales aboard. The top pic could be the 1924 REPULSE/HOOD visit or the 1927 RENOWN visit with the Duke & Duchess of York. The press pics of RENOWN berthing in 1920 show her without the bunting dressing her aft and amidships, so I’m still puzzled over the top pic. There’s bound to be a Navy protocol answer to that. As for the numbered launches, that’s a hard one because they’re all in their 1920 (or 1924 or 1927) configurations. #3 is LUANA surely. The dark boat at the lead is probably Tom Inglis’ OLIVENE or OLIVE JEAN. The second photo will be from 1920 because the yachts in it are displaying the 1914-1921 sail registration numbers. These were replaced by the alpha-numeric system in 1921 (e.g. A-3 Ariki, B-1 Ngahau, C-1 Queenie etc etc ). “Renown”, “Repulse”, ’20, ’24, ’27 …………… Whichever, it HIS Majesty’s Ship back then.